Since the early 21st century in the food industry, raw cranberries have been termed as very popular fruits. Cranberries are known as "super fruit" due to their high nutrient content and antioxidant qualities. They are processed into products such as juices, sauce, jam, and sweeteners. Cranberry juice offers good protection against bacterial infections caused by E.coli in the urinary system by preventing attachment of the bacteria to the walls of the bladder and urethra. Cranberries prevent plaque formation on the tooth enamel by interfering with the ability of another bacteria, Streptococcus mutans, to adhere to the surface of the teeth. This helps in preventing the production of cavities which is almost as similar as preventing urinary tract infections. Cranberries are also good sources of many vitamins like vitamin C, vitamin Ac Carotene, lutein, zea-xanthin, and folate and minerals like potassium, and manganese which helps maintain healthy skin and also provides strength to the bones. Cranberry juice helps stop certain strains of the Haemophilus influenza, which is one of the most common causes of ear and respiratory infections in children. The juice prevents the bacteria to adhere to the surface of the skin. 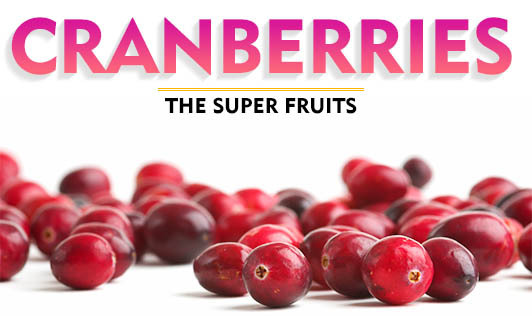 Cranberries are so delicious and nutritious that one should never miss an opportunity to have this super fruit. Sadly, it is rarely found in India but dry cranberry, cranberry juice, and cranberry extracts are available in super markets. These are equally beneficial and can be added to homemade juices and purees. Apart from adding to the taste, cranberries aid in curing various illnesses your body might be battling with.